America's Cup yacht racing is perhaps the world's most exclusive sport. The yachts that participate in these races cost a staggering amount of money to build and race. There are not many of them and they have very small crews. As a result, very few people have experienced the excitement of sailing in one of these craft. 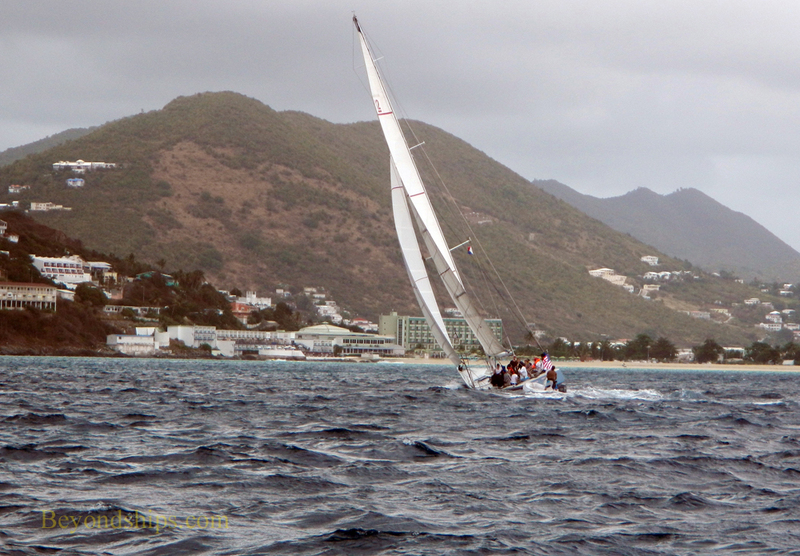 However, a shore excursion in St. Maarten offers guests a taste of this sport. No national honor is at stake and it does not involve the rigorous training that the crews in the real competitions undertake. But it does let you see what going to sea in these unique craft is like. The America's Cup is actually British in origin. In the mid-19th century, the 1st Marquess of Anglesey, who had commanded the British cavalry at Waterloo, purchased a trophy from silversmiths Garrard & Co. and donated it to the Royal Yacht Squadron. It was not an especially distinguished work, rather just an off the shelf model, which would serve as a trophy for the 1851 edition of the Squadron's annual race. Much to everyone's surprise, the 1851 race was won by the yacht America from the United States. The winners took the trophy home and gave it in trust to the New York Yacht Club under a deed that specified that it would be awarded to the winner of an international challenge competition. Over the next 132 years, the Americans successfully defended the Cup through 26 challenges - - the longest winning streak in sports history. Then in 1983, the Australia II succeeded where so many others had failed and the Cup was taken to the Land Down Under. After having held the Cup for so many years, this was a blow to America's national pride. Denis Conner, the captain of the losing yacht in the 1983 race, began a campaign to re-take the Cup. However, before his new yacht, Stars and Stripes, could meet the Australians, it had to defeat the other challengers, which included New Zealand and Canada, in the Louis Vitton Cup competitions. In a series of difficult contests, Stars and Stripes won the right to challenge. The world then watched as Stars and Stripes defeated the Australian Kucckabura II off the coast of Freemantle, thereby bringing the Cup back to the United States. After achieving this historic success, you would think that Stars and Stripes would have been retired to the Smithsonian Institute. However, the United States is not very good about honoring its historic ships. Instead, in 1996, the Stars and Stripes came to St. Maarten where she “races” against four other 12 metre yachts including Louis Vitton Cup veteran Canada II and True North, a participant in the 1986 World Championship. A representative of the St. Maarten America's Cup 12 Metre Challenge met us on the pier between our cruise ship and another. There were about 26 people in the group, a little more than half from our ship. Some of the people had done this excursion before and were wearing tee-shirts to prove it. Most of the participants had never been on a sailboat of any kind before. Some were solo travelers, others were couples. There were no children. Once the group was assembled, the representative led us through St. Maarten's cruise port stopping at the public restrooms. He pointed out that these yachts were built for racing, not comfort. Therefore, they have no restrooms and since we would be aboard for nearly three hours, prudence called for a stop. We then proceeded to a pier near the water taxi pier where we met another representative. He gave us some background about the yachts and divided the group in two, careful to keep couples and friends together. A flip of a coin would determine which group would “crew” which boat. While I was hoping to go on the historic Stars and Stripes, I was not too disappointed when I was assigned to True North. My ambition was to take photos and you cannot take a photo of a vessel sailing when you are on that vessel. To take photos, I had brought my waterproof camera. It does not take as good an image as some of my other cameras but having been on sailboats before, I knew it can get very wet on a sailboat. This was confirmed when the representative said that smart phones and regular cameras should be stored below deck on the yacht. There was no prohibition on taking pictures, it is just that smart phones and regular cameras do not react well to getting wet. A power launch took the participants first to Stars and Stripes and then to True North. A moving sea added some excitement to shifting from the launch to the yacht. The yacht was about 70 feet long. While the word “yacht” evokes images of comfortable seats, bars and other luxuries, these yachts are quite spartan. All of the equipment is devoted to racing, creature comforts are just unnecessary weight that would slow the boat down. Each person was assigned a specific space on the yacht. The only people who moved around the boat during the voyage were the captain and the two professional crew members. Guests on this excursion can either join with the professional crew in sailing the yacht or simply go along for the ride. The assigned tasks ranged in rigor from grinding the winches to watching a stop watch. Most people chose to do a task but I declined. Having sailed a sailboat before these tasks held no novelty and more importantly, I wanted to be free to take photos. The captain did not reply but assigned me to the furthest forward spot on the yacht - - the spot most likely to be dosed by the waves. We were also asked if we wanted a life vest. Most people said no as did I but thinking about it later, the ones that said yes were probably wise. The yacht was going out into the open sea and with all the moving parts such as the boom, one could be knocked into the water in an injured state. One of the participants was assigned the task of being the bartender. This put her in charge of distributing the bottled water, soft drinks and beer. However, there was not much time for drinking on this voyage. As True North upped anchor and headed out of the Great Bay, you could see rain storms coming over the hills from the French side of the island. Not only would these add to the wetness but they would bring stronger winds to propel the yachts. Once outside of the bay, True North joined Stars and Stripes, the two yachts circling around each other like fighters sizing each other up. A crew member explained that the two yachts would race around a somewhat oblong course. Going downwind would be a direct line but going against the wind, the yachts would have to tack in a zig zag fashion. The conditions favored neither boat. Both were built with the strong winds off Freemantle in mind. However, at first True North was ahead. Both boats were hurtling along. At one point, Stars and Stripes was so close that it seemed like her bow as going to overlap True North's stern. When the time came for the first tack, the captain warned us that things were about to change. True North leaned over so that it seemed like she was about to capsize. The sea ran past the side of the boat seemingly inches away from washing over the deck and into the passenger compartment. Indeed, during one turn a wave washed over me. Meanwhile, the grinders were vigorously cranking and the sail lines were moving. Overhead, the magnificent sail was puffed out in the wind. Coming around one of the marker buoys, Stars and Stripes pulled ahead. At the same time, True North failed in her maneuver and had to circle back. This gave Stars and Stripes and insurmountable lead. Nonetheless, True North continued on. At one point, we were so hard over that it seemed like the sail must be parallel to the water. Even though the race was effectively over, it was still thrilling to ride this boat. Eventually, the two yachts returned to the bay. There we were met by the same launch that had taken us out to the yachts. This time, however, she had another group who would be going out on the yachts and so we had to exchange places. The launch took us to the 12 Metre Yacht Club at Bobby's Marina in downtown Philipsburg. Complimentary glasses of rum punch awaited the group. In addition, there was a gift shop with tee-shirts and other souvenirs. After about 15 minutes, you could either take the launch or stay in Philipsburg.